Have you ever felt like Tacky the Penguin? Like the way you walk is different from the way the other people in your group walk? Like the songs you sing are different than the songs the others sing? Like everyone else is quiet and polite, and you are just too loud and tacky? Or maybe you feel the exact opposite, like everyone around you is exciting and interesting and you are the only quiet one? Like you are an odd bird? When you are the outlier, like the only white crow in a world of black crows, you can start to get the impression that there’s something wrong with you. Whether you are the only poet in a group of scientists, or the only atheist in a congregation full of theists, there can be a lot of pressure from your family, or congregation, or neighborhood to be like everyone else. When I was a little girl, I had no trouble fitting in to my family- I was a bookish introvert among bookish introverts, a UU among UUs, a liberal among liberals. But as soon as I went off to school I knew something was wrong with me. I was a bookworm among kids who loves sports, I was a UU among fundamentalist Christians, and a liberal among conservatives. And my parents ran a music school instead of having a normal job like lawyer, or salesman or project manager. I felt like Tacky pretty much all the time. As much as my peers pressured me to change, I just couldn’t figure out how to change into the person they wanted me to be. It wasn’t until I went off to seminary, and took the battery of test they give all aspirants for UU ministry, one of which was the Meyer’s Briggs personality Type index, I learned that my type is called “INFJ” which represents less than 1% of the population. I began to think of my differences not as character flaws to be fixed, but as unique gifts that I could use to serve the world in my own way. Our biological diversity, our psychological diversity, is important to the survival of the species. Each biological difference evolved to fill some niche in our eco system. The more diverse we are, the more prepared we are for a changing future, and for the survival of life itself. Consider that first living being to photosynthesize light into energy was undoubtedly an outlier, but that diversity was so useful, now plants fill our world. The same is true of our personality differences. The world needs Introverts, who can spend large amounts of time alone doing that work best done in solitude, and the world needs extroverts, people who can spend all day engaged with other people. The world needs scientists and poets and farmers, the world needs people who notice the small details, and people who see the big picture. The world needs people who can follow a schedule and make plans, and the world needs people who can be spontaneous and improvise when the plan falls apart. 2. Protection. We odd birds need to be able to say “you can’t tell me who I am” We need protection from message that we are wrong for being different and from attempts to make us like everyone else. 3. Communication. We are encouraged to proactively communicate why we are like this, where we are coming from. For example, now that I know I am an introvert, and that this is a perfectly okay thing to be, I was able to say to my colleagues this past week “I’m going to go get 20 minutes of introvert time before we start up again” and no one batted an eye. 4. Healing. If your parents always made fun of you for reading a book instead of watching football with the family, or for being a vegetarian when the rest of the family ate the traditional American diet, you’ve probably got an Ouchy spot in your spirit around that. What could you do to honor that part of yourself, and to heal those old pains? The great thing about growing up, is you get to find your people. A white crow among white crows is just one of the crowd. For example, after a lifetime of thinking I was literally the most liberal person on the planet, I moved to Berkeley California and began to feel pretty main stream. Being a white crow among white crows is a bit of a relief. This is the reason for Pride Days, for conferences, for affinity groups. To have a place where you can be yourself and no one looks at you like you have lobsters crawling out of your ears. TO talk the way you naturally talk and be met with understanding nots instead of blank stares. It feels comfortable to be an insider. It’s a form of privilege. I wonder if you can think of any examples in your own life, where you have been part of the majority and noticed someone else who had trouble fitting in? Part of the reason the worship team does surveys, and the committee on Ministry does evaluations of church life is to make sure that the both the white crows and the black crows have a voice. 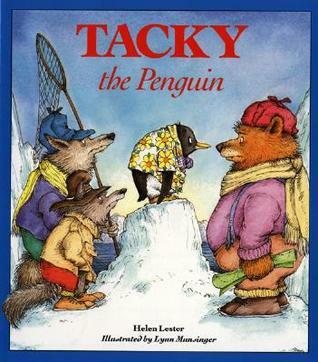 We are such a diverse group of people I bet every one of us has felt like Tacky the Penguin at some moment or other. And in most circumstances what we expect people to do is adapt to the majority. 1. Support the outliers in your family, your church, your office, in getting to their flow state part of every day. Make sure the extroverts get time socializing with people. Encourage children have trouble sitting still, make sure they get plenty of time to run around each day. 2. Don’t thwart or frustrate their diverse needs. When someone says something or does something you don’t understand, probably it is coming from a radically different perspective than yours. Have you ever been at a congregational meeting and someone asks that question that you just can’t understand why that would be important? If we say “what a thing to say!” or “that question is not important” We need to find ways of validating one another instead of dismissing their unique perspectives and needs. Because not only do each of us need to feel heard and understood, their unique perspective is important to the health and well being of our community. Remember Tacky the Penguin, whose unique perspective saved the day.